These yummy roll-ups are a cinch to make. Get out the refrigerated pizza crust, ham and mozzarella and we'll walk you through the recipe. Preheat oven to 400°F. Unroll pizza crust dough onto lightly floured surface; press to form 12x8-inch rectangle. 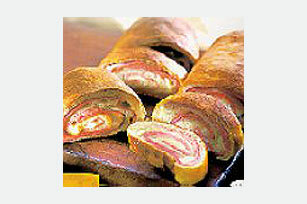 Arrange ham slices evenly over dough to within 1/2 inch of edges; sprinkle evenly with cheese. Starting at one of the short ends, roll up dough to form log. Pinch seam together to seal. Place, seam side down, on greased baking sheet. Bake 25 to 30 minutes or until deep golden brown. Let stand 10 minutes before cutting into 8 slices. Serve with yellow mustard or KRAFT Horseradish Sauce, if desired. Substitute POLLY-O Shredded Mild Cheddar Cheese for the mozzarella cheese. Top cheese with 1/4 cup sliced pitted ripe or stuffed green olives before rolling up dough. Assemble recipe as directed; cover. Refrigerate up to 4 hours before baking. When ready to serve, uncover and bake as directed.